I spent a little time Monday morning photographing my nephew, Reid, for his 9-month pictures. I’ve rarely met a happier toddler, but Reid was off his usually jubilant mood that morning likely due to the pain from the 2 upper teeth he was cutting. Still we were able to power through at times for some smiles. 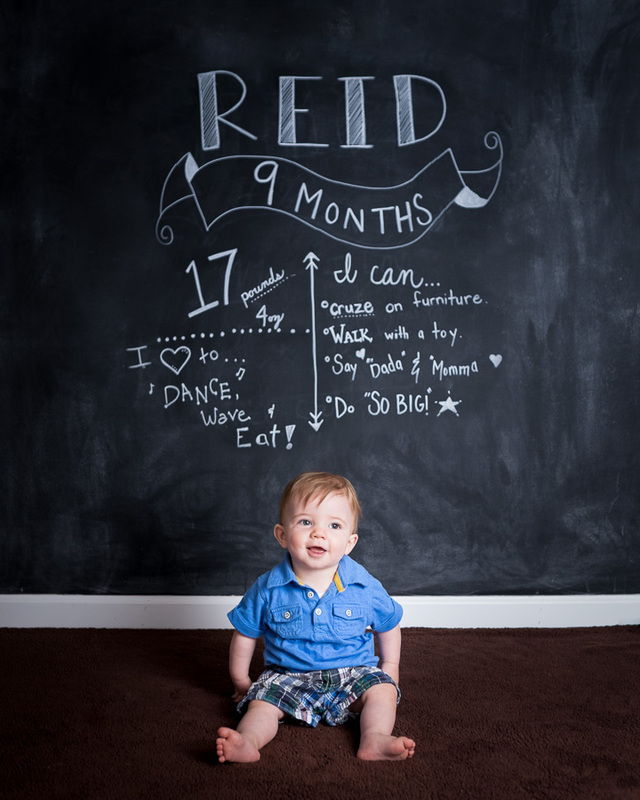 My sister once again had the chalkboard wall in her basement caligraphied and ready with Reid’s updated milestones since his 6-month photos, unfortunately this time she chalked those milestones down with permanent chalk markers. It’s fair to say the wall is going to need a fresh coat of blackboard paint before we finish the series on Reid’s 1st birthday. Reid is sitting much steadier now than at 6 months of age so after the chalkboard photos I sat him at a table in a corner and gave him a toy train to play with. These photos are my favorite from the morning. Toy train, blocks, blue wall, to me they definitely say boy. After finishing the inside photographs, we moved outside for some sunny, spring pictures. It was after 11am and the sun was high overhead and casting a harsh light so we worked with shade and what we could with the sunlight. Shortly after moving outside we were able to get a few more smiles out of Reid by playing “Flip the Toddler”, but he was getting fed up with the session quickly so we wrapped up soon after. Toddlers are tough photo subjects at Reid’s age. They are sufficiently mobile that you have to be quick on the shutter or find something that will occupy their fleeting, but insatiable curiosity long enough to make some photographs. 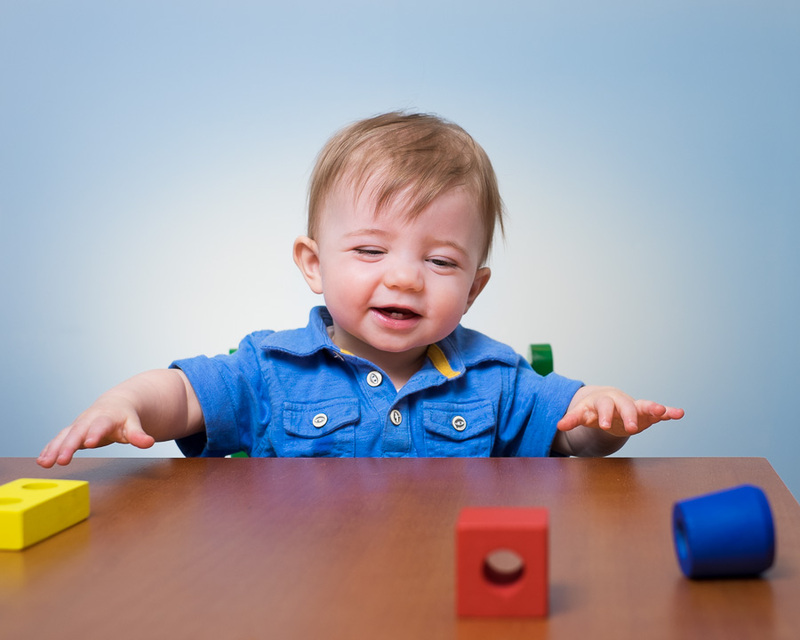 It’s easy to loose a toddler quickly and often the parents follow as they begin to feel a mixture of embarrassment and frustration as their child’s mood deteriorates. It’s my job to find the cracks, the moments when the toddler is cheerful. It’s my job to make those cracks as necessary. To make even the photo sessions that don’t go off so well, look like they were smooth and simple. I was able to get several photograph’s of Reid that I am really happy with, but I feel like I left many unmade. I suppose that is one of the reasons I keep making photographs.